It's been a remarkable rise to prominence for Andrew, or Add2Basket as he's more commonly known. From the first release on his own Add2Basket imprint in May of 2006, to the international gigs and releases on major labels of today; it's been a whirlwind year or so for Andrew. 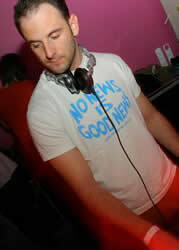 His productions have been rapidly finding favour with a host of A-list DJs. From Desyn Masiello to Luke Fair, the Add2Basket sound can be found on dancefloors the world over. His signature melodies give his music an uplifting quality that has already brought it to the attention of labels like Alternative Route, Extrema and Sick Watona. As well as a host of regular gigs and high profile residencies in his native Hungary, the last year has seen Andrew travel the world, with gigs in Brazil, China, Argentina, Uruguay, Mexico and all over Europe, guesting at such prestigious venues as Pacha in Sao Paolo. Not content with just following the path of a successful DJ and producer, Andrew doubles as a label owner. Andrew's label has stepped up a gear in recent months. With a host of talented producers on board such as Emjae, D-Pulse, Hernan Cerbello, Liluca, Phunktastike and Interplay, and a few extremely strong releases in the pipeline, Add2Basket recordings is making waves in the house community. The Add2Basket brand is fast becoming a name synonymous with quality – be it as a producer, DJ or label. Make no mistake, this is a man who's going places.